Coupled with high nuclear and hydro availability, the abundance of shoulder-season supply is causing record low pricing. The system operator banned negatively priced exports 13 months ago, which is preventing the Hourly Ontario Energy Price (HOEP) from dropping far below $0/MWh, but the price was negative 77 hours during the first 14 days of November (23% of all hours). On Thursday November 14th, the wind record was accompanied by an average HOEP of $.5.90/MWh (0.59 cents/kWh) - lower than the monthly average of $10.52/MWh ( a little of 1 cent/kWh), but not by much. 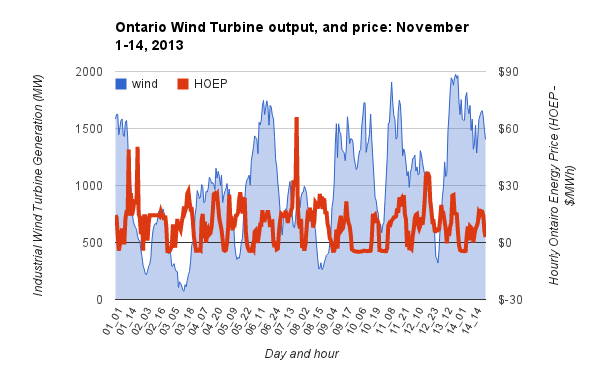 The current record low monthly average HOEP is $15.45; for average wind output it's 785MW. Both look likely to fall this November - pushing the global adjustment charge to a record high.